This year has been the year of the Chart of the Year. Seriously. Charts on blogs, especially economic charts, have become such a big deal that I counted at least half a dozen year-end roundups of the “Best Charts of 2011.” Despite my love of charts, though, I haven’t chosen a chart of the year myself. There’s just no single chart that explains everything. Despite rebounding from its recession valley, net business investment as a share of net national product is still far below historical levels. Household and institutional net investment as a share of net national product is at a 40-year low. And perhaps most disturbing, government net investment is only 1% of net national product, a 40-year low. 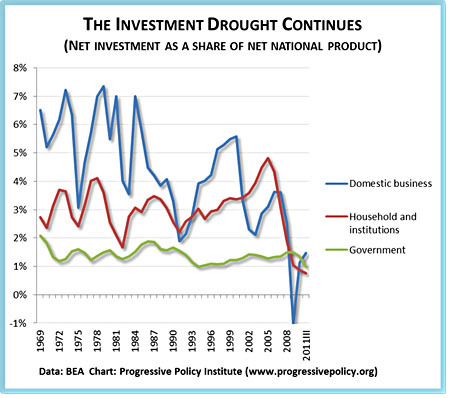 Let me repeat that: Government net investment as a share of net national product is at a 40-year low. I had to check this last one a couple of times to make sure it was really true. This is a true failure of national economic policy. Government is punking out, just at the time when a public investment surge is needed to make up for the private investment drought. As a country, we should be investing more, not less. There are lots of things happening in the economy besides this, and if you want to, you can even convince yourself that there’s not much going on in this chart except a steep drop in construction that’s making the overall investment picture look worse than it is. There’s a little bit to that, I think, but only a little bit. Household investment was obviously heavily impacted by the housing bust, but business investment and government investment have been on a secular decline for more than two decades now. Is this because we’re entering an era that’s fundamentally less capital intensive than it used to be? After all, Facebook has built up a multi-billion dollar business with only a few thousand employees and a level of investment in plants and equipment that Andrew Carnegie would have laughed at. That may be part of it, but it’s hardly comforting regardless. One way or another, American capital needs to be marshaled for use in the real world, but increasingly the real world simply doesn’t look like a great investment opportunity. Recovery is going to be mighty tough as long as that remains the case.